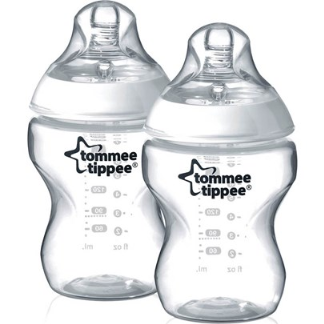 The revolutionary Tommee Tippee Closer to Nature bottles with their unique teats that mimic the natural flex, stretch and softness of a mums breast whilst the super sensitive anti-colic valve helps to eliminate the discomfort felt with trapped wind. Winner of Mother & Baby Gold Award - Best Feeding 0-6 months Capacity 260ml. 2 pack. BPA free. Wide neck bottle. Slow flow teats. Teat designed to mimic the natural flex and feel of a mum's breast. Super-sensitive anti-colic valve. Soft natural feel silicone teat. Easy hold bottle with a slow flow teat.